Forge, 2003 (hardcover and paperback, both out of print); Kindle, 2011; Nook, 2011; Sony Reader, 2011; Kobo, 2011, and Apple iBook, 2011 (all $3.99 ebooks). Also in Large Print, 2015 ($15.95). 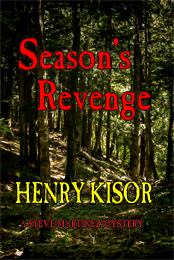 Season’s Revenge, the first in the Upper Peninsula of Michigan mystery series featuring Steve Martinez, begins during the weeks before Christmas. Big events are stirring for Lakota-born deputy sheriff Steve Martinez. The normally sleepy town of Porcupine City on the southern shore of Lake Superior is uncharacteristically alive with activity after the body of one of its most respected and powerful residents, Paul Passoja, turns up at a fore st campsite, the victim of what appears to be a bear attack. From the moment he arrives on the scene, things just don’t add up for Steve. Why would Passoja, a skilled camper and hunter, be careless enough to scatter bacon grease near his tent? Led by curiosity, Steve begins an unofficial investigation of the mishap only to discover that the “random” animal attack might not be so random after all. It seems that quite a few people in town had reason to do in Passoja, but the evidence points to no one in particular. The more Steve investigates, the deeper he sinks into a mystery as old as the town itself. The seemingly peaceful forest haven was once a hotbed of treachery, and ill will only ripens with age. As he gets closer to the murderer, Steve learns the hard way that whoever killed Paul Passoja is more than willing to kill again. But Steve's Native American ancestors never were ones to fold, and neither is he. Season’s Revenge was a 2003 “BookSense 76 pick” by independent booksellers around the country, and was reprinted as a Forge paperback.